Shopping can be tricky, so many choices sometimes it’s hard to know where to start. Throw in finding something that fits, the right colour (aargh!) - overwhelming! Style Liberation can help. We'll set up a phone call so we can find out what you need and what your challenges are. 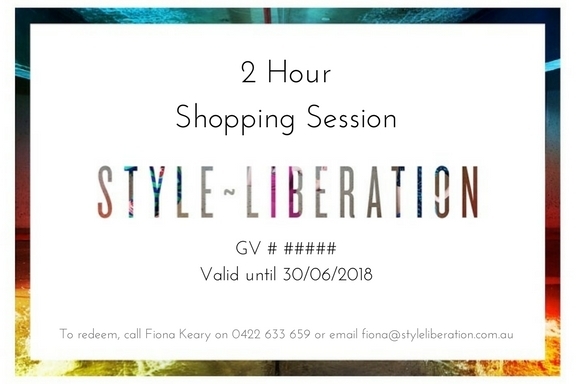 Then, we’ll take you on 2 hour shopping trip where we’ll find pieces on your shopping list, show you how to put together outfits and discuss colour and how to dress for your body shape. You won’t just walk away with new clothes, you’ll also walk away with the tips and tools to create outfits that you love and the confidence to shop for yourself in the future (basically we’ll do ourselves out of a job). You don’t buy with us – you put items that you like on hold. Two reasons, firstly, we never want you to feel under any pressure to buy something that we've suggested and secondly, you may find something better at another store. At the end of the session we’ll go through the items that you have on hold and prioritise them. You’ll reassess each piece to make sure that they go with other pieces in your wardrobe and that they’re a good investment. Includes Discovering Your Style and Wardrobe Rescue.